Objective Usability of electronic health records (EHRs) remains challenging, and poor EHR design has patient safety implications. Heuristic evaluation detects usability issues that can be classified by severity. The National Institute of Standards and Technology provides a safety scale for EHR usability. Our objectives were to investigate the relationship between heuristic severity ratings and safety scale ratings in an effort to analyze EHR safety. 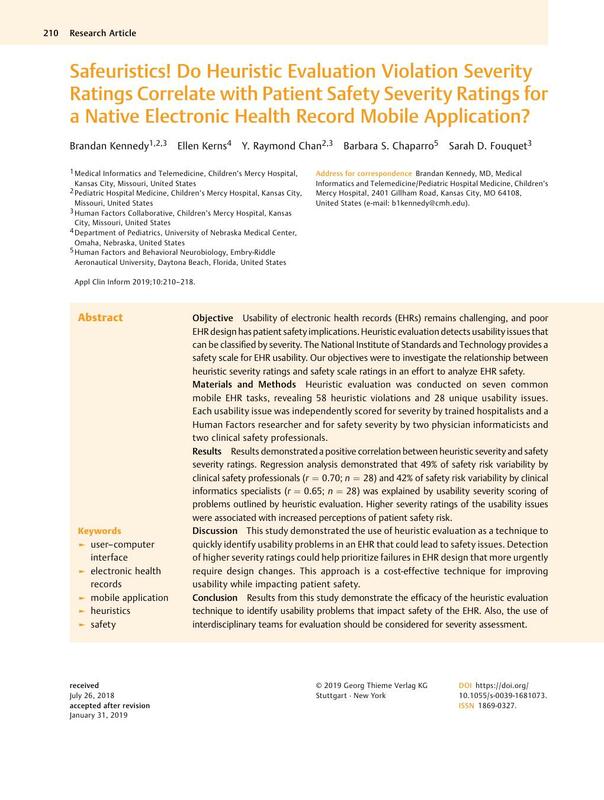 Materials and Methods Heuristic evaluation was conducted on seven common mobile EHR tasks, revealing 58 heuristic violations and 28 unique usability issues. Each usability issue was independently scored for severity by trained hospitalists and a Human Factors researcher and for safety severity by two physician informaticists and two clinical safety professionals. Results Results demonstrated a positive correlation between heuristic severity and safety severity ratings. Regression analysis demonstrated that 49% of safety risk variability by clinical safety professionals (r = 0.70; n = 28) and 42% of safety risk variability by clinical informatics specialists (r = 0.65; n = 28) was explained by usability severity scoring of problems outlined by heuristic evaluation. Higher severity ratings of the usability issues were associated with increased perceptions of patient safety risk. Discussion This study demonstrated the use of heuristic evaluation as a technique to quickly identify usability problems in an EHR that could lead to safety issues. Detection of higher severity ratings could help prioritize failures in EHR design that more urgently require design changes. This approach is a cost-effective technique for improving usability while impacting patient safety. Conclusion Results from this study demonstrate the efficacy of the heuristic evaluation technique to identify usability problems that impact safety of the EHR. Also, the use of interdisciplinary teams for evaluation should be considered for severity assessment.